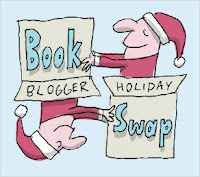 This year I chose to participate in three Holiday Book "programs": Reading in Color's Holiday Book Exchange; the Book Blogger Holiday Swap; and the Booklover's Secret Santa hosted by the Neverending Shelf and Bookworming in the 21st Century. I have received all three of my packages and couldn't wait to open them and share what I got! Since I leave town on the 17th I figured I get to open these presents early (yes, it's just an excuse). The first package I received was from Pam at Bookalicio.us. I also sent her a gift...just coincidence? Totally cool. Check out what I got... a HUGE THANK YOU to Pam! I have heard such good things about The Cellist of Sarajevo so I am very excited to add that to my TBR shelf. And, a Banned Books bracelet (the updated version)...I will wear it with pride in my library! The second package I received was from Wendy at Literary Feline for the Book Blogger Holiday Swap and I was totally excited when I got the package in the mail! She included 3 books all of which I will read for my Middle East Reading Challenge (The Yacoubian Building by Alaa Al Aswany, Women Without Men: A novel of Modern Iran by Shahrnush Parsipur and Tuba and the Meaning of Night by Shahrnush Parsipur), beautiful post-it note set, 2 bookmarks (trust me, I can never have enough of those), lotion, a stocking full of chocolate, and fuzzy socks (which my daughter immediately stole from me). Wow! HUGE thank you to Wendy! My final secret santa package arrived just an hour ago from Doret of the Happynappybookseller and I am excited again... no repeat books! My package contained 2 books: Madras on Rainy Days by Samina Ali and When the Stars Go Blue by Caridad Ferrer. Another HUGE thank you to Doret! Isn't it sooooo awesome to get secret santa books??? I just love doing them! Wow ... what generous and wonderful gifts! Who needs Santa when you have fellow book bloggers! Enjoy. Ah! I wish I did more Secret Santa's this year! Jenners--They were generous! The real Santa has some big expectations to fill! Your other gifts look wonderful! 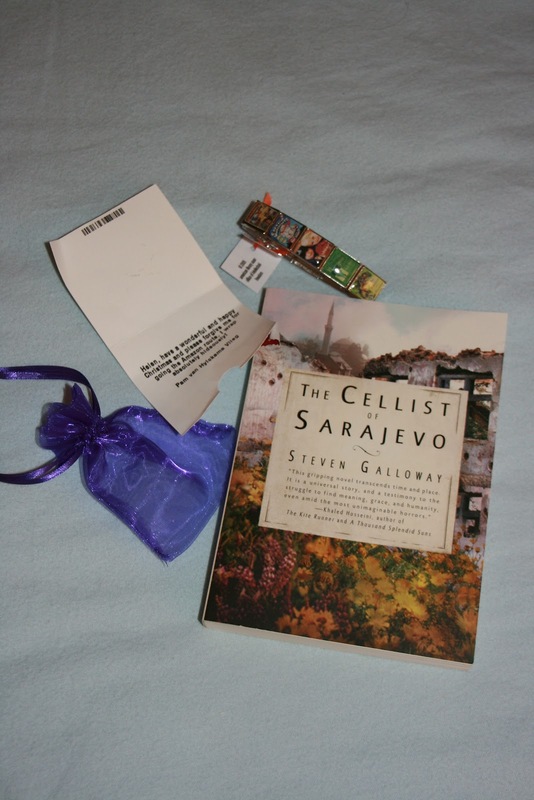 I hope you will enjoy The Cellist of Sarajevo as much as I did. Literary Feline--Thank you again! 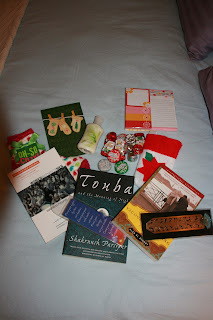 I am excited about all the books (and stuff) that I got! 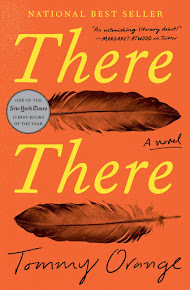 Amanda--Maybe Pam was my Neverending book swap person...it would be strange for it to happen twice. Glad to see the books arrived. Enjoy.